Thursday 7th of December was the day. The setting, the International Space Station linked to a medieval town in central Italy nestling on the lower slopes of Mont Ingeno. That town is Gubbio our local town. Settled in pre-history there runs throughout the town a strong sense of tradition and bond of loyalty, but that does not mean that the Eugubini are not open to a bit of change and progress and boy they certainly do know how to party and to invite celebrities! So it was at dusk on last Thursday this surreal technological link took place as a signal from the International Space Station circulating some 350km above the earth was sent by Italian Astronaut Paolo Nespoli all the way down to deepest Umbria to switch on the 460 lights that make up the “World’s Largest Christmas Tree“. 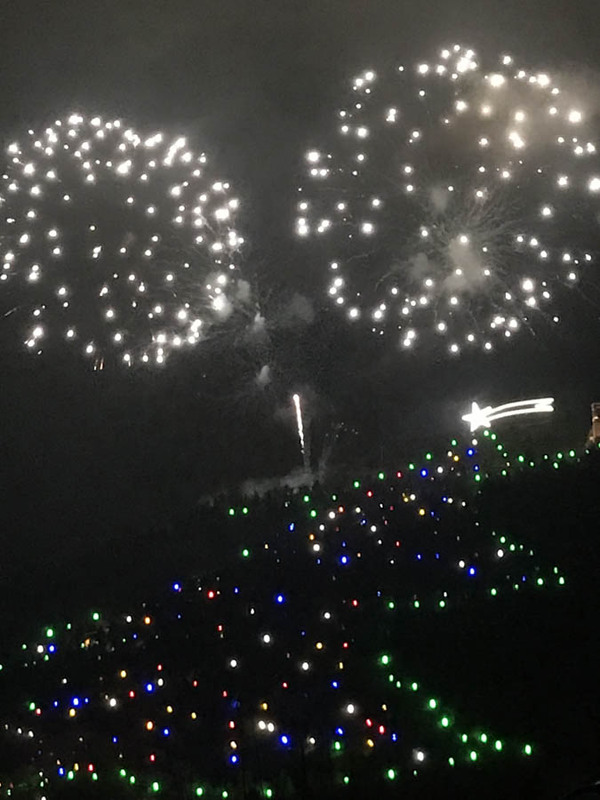 Gubbio was packed solid, hotels, bed and breakfasts, agriturismi, and private homes all welcoming visitors from all over the world to witness this great switch on. 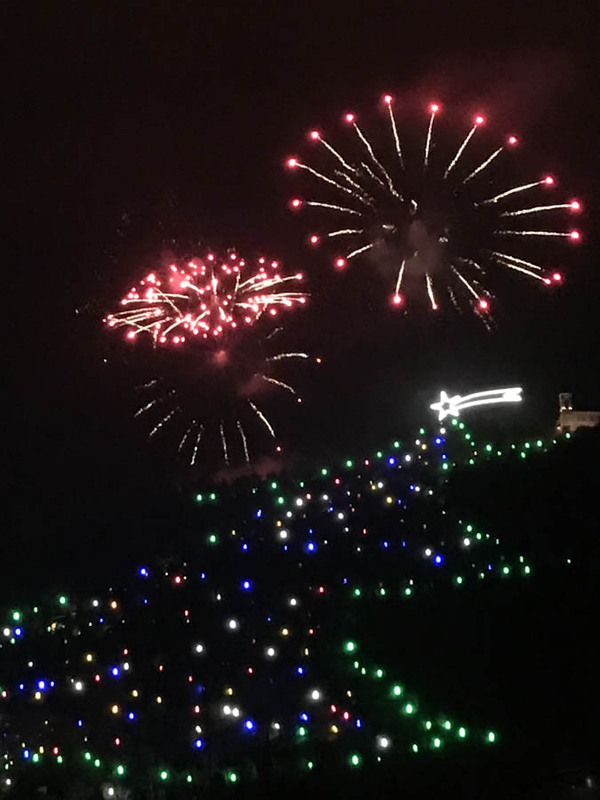 We from Bellaugello Gay Guest House were lucky to be invited to a private home to witness the event, great hospitality, wonderful apri-cena, and seemingly endlessly flowing prosecco and to boot a first class view of this tree which rises from the ancient city walls to the top of Mont Ingeno. 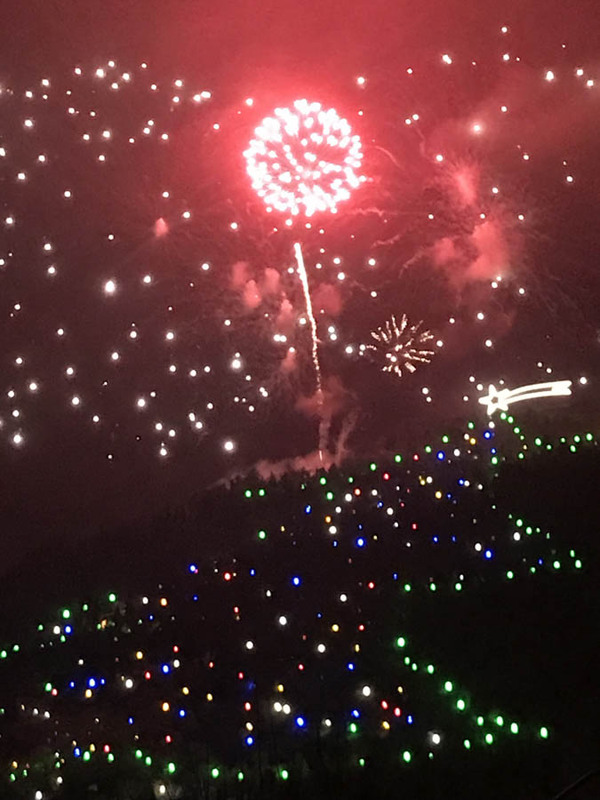 More than 460 lights are lit using 8,500 metres of cable stretching 650metres up the hillside. It is a gargantuan task undertaken by a squad of 50 volunteers who start erecting back in October. But such is the strength of the locals or Eugubini, they love a huge project and to do things together. 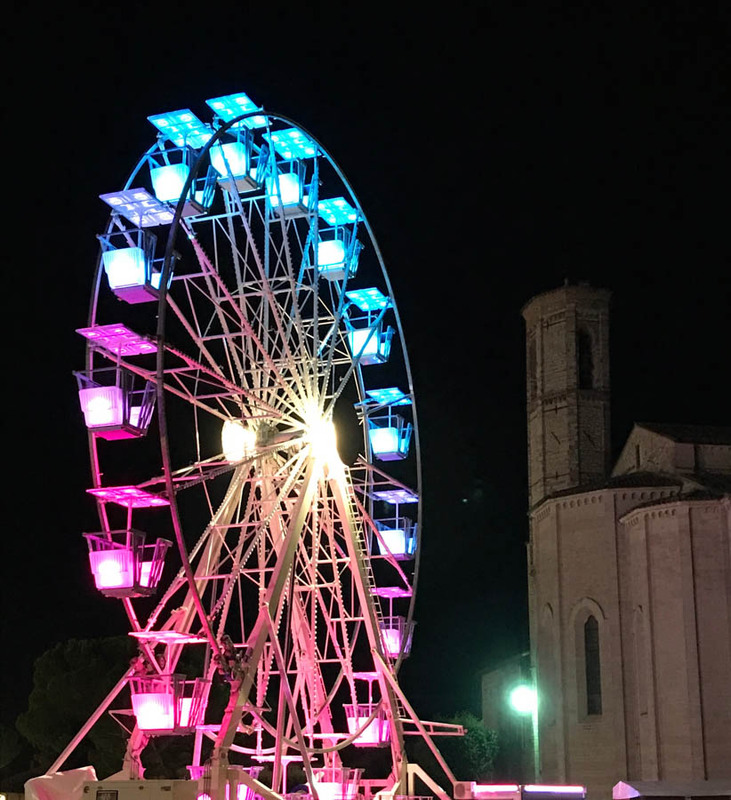 Gubbio really is a blend of the traditional and modern as this wheel spawned doubtlessly from the London Eye and landed in the lower Piazza and the following event goes to prove. 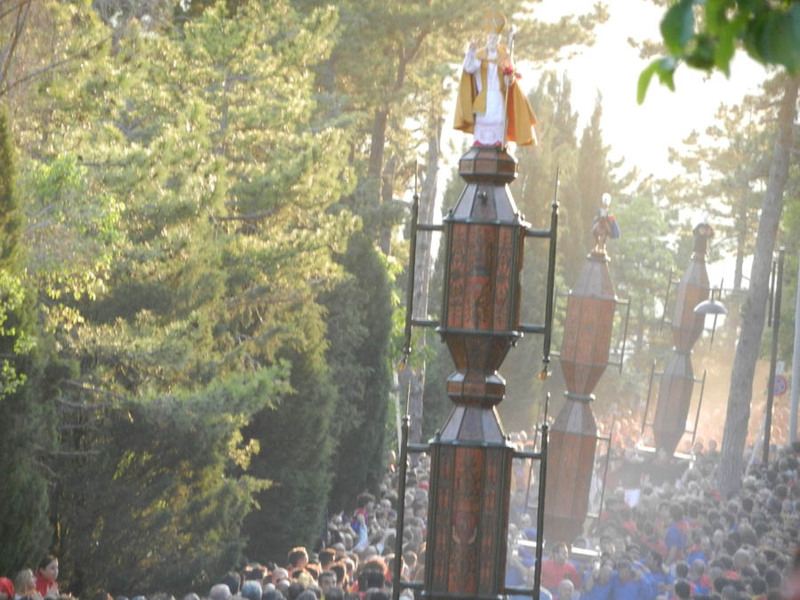 The next big date for the Eugubine calendar is May 15th when the annual ‘Corso dei Ceri‘ or race of the candles is run. 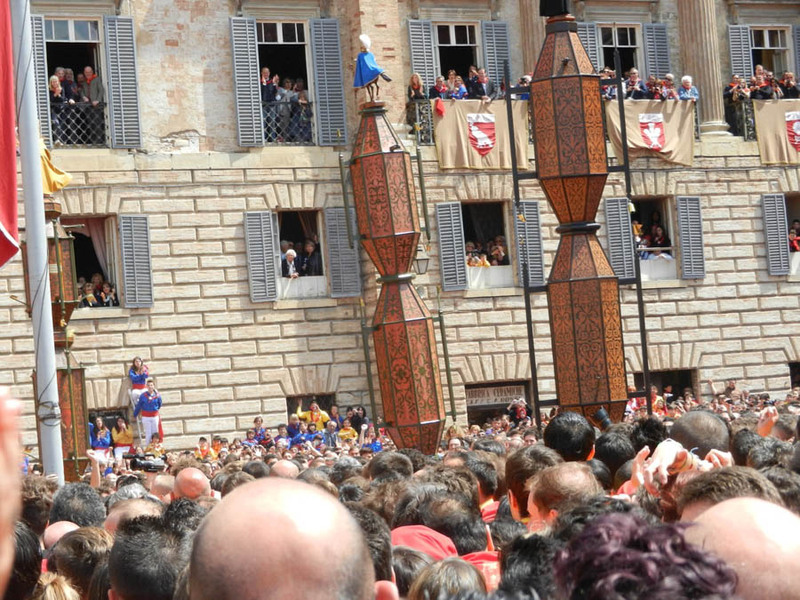 The first Sunday of May the three wooden phallic ‘candles’ are processed down from the church on top of the hill, seen to the right of the star in the photographs, and left in the Palazzo Ducale until the morning of 15th May when the three teams each representing a saint; Ubaldo, Antonio and Giorgio, meet in the Piazza Grande in the ancient historic centre of Gubbio. 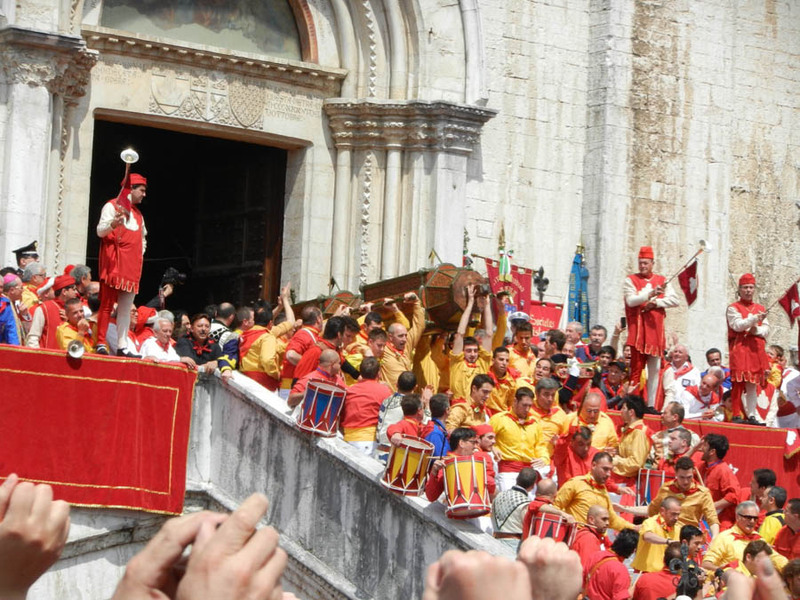 The Ceri are brought out of the palazzo horizontally and mounted in their H framed holders and after a dousing in wine they are raised vertically and processed round the town. And then following a large and lengthy lunch, it is Italy after all, the Ceri are raced back up Mont Ingeno to the church of San Ubaldo. This amazing day is the culmination of a year of planning, and is an event held by the locals for the locals, but one which you are welcome to attend.